There was market confidence behind Tranmere, who were backed from 2-1 into favouritism, but their winning sequence was stopped at seven in front of a large travelling support of 2,342. It was a game of few chances with Oldham scoring at crucial periods and both goals coming in similar circumstances as Callum Lang twice dribbled across the pitch before finding the bottom corner of the net. The opener on seven minutes saw Lang nutmeg Mark Ellis far too easily and Tranmere's other centre-back Manny Monthe was done for skill by the lively home forward for the second. Oldham's early lead gave them something to defend and it was a largely forgettable first half on a tricky pitch with Athletic starting the better before Tranmere began to control the match. Rovers created little but showed more intent after the break with Monthe's header hitting the top of the net and substitute Jonny Smith's shot well saved by Danny Iversen. However, shortly after Smith's effort, Oldham hit Tranmere on the break through Lang and it was always an uphill task in the last half-hour or so. Ellis nearly produced a grandstand finish but failed to connect properly with a cross from Connor Jennings. Micky Mellon made one change from the 3-0 win over Carlisle on Saturday, enforced by Luke McCullough's season-ending injury. Jay Harris replaced central midfielder McCullough in a 4-2-3-1 formation. Mellon clearly was not entirely satisfied with the shape of the side, switching Jennings from the left into the number-ten position – a swap with Ollie Banks, who would later drop deep when Smith came on to add further attacking options for Tranmere. Jennings made much more of an impact centrally and Smith gave the team greater balance. Until he arrived nearly all of Rovers' attacking play came down the right through Kieron Morris. The final ball was rarely on the money but when Smith was introduced there was more dynamism down both flanks with Morris arguably Tranmere's biggest threat in the first half. After conceding two goals in nine matches prior to this trip to Boundary Park, Tranmere were expected to be strong defensively but Lang's direct approach seemed to unsettle the visiting centre-backs. McCullough's cruciate knee ligament injury could be a real blow for Mellon's men as he had become a mainstay of Tranmere's midfield, having started all 36 league matches since arriving on loan from Doncaster until his absence at Oldham. 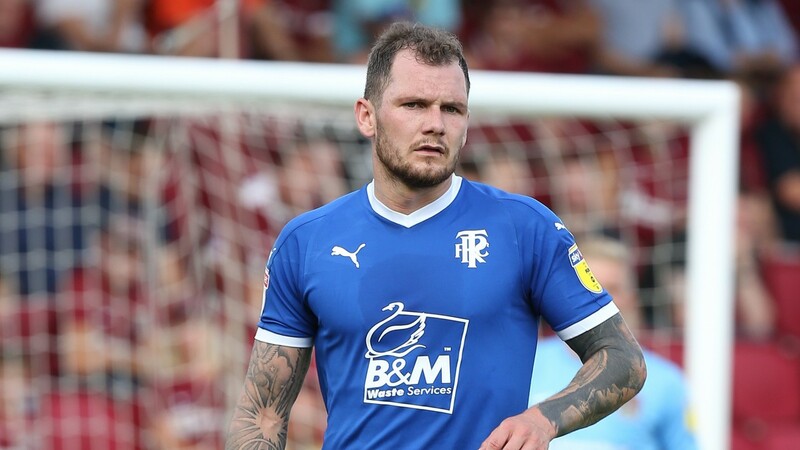 James Norwood, the star of Tranmere's season with 27 goals in Sky Bet League Two, will win the Golden Boot barring a miracle but he cut a frustrated and isolated figure at times in this contest. Norwood was nullified by experienced centre-back Peter Clarke and there is a reliance on him for goals, particularly as Banks, one of those chosen to create, had a relatively poor match. Norwood had notched nine in ten before a blank at Oldham so he is allowed a quiet night every now and then. It would be wrong to dismiss him given the season he has had and the poacher is always looking to play on the shoulder of the last defender. However, on this evidence the two to take were Jennings, once he moved to a central position, and centre-back Monthe. Both of Monthe's goals this season came in March and he clearly has a taste for it now, producing three efforts at goal. Mellon said: "We are still in a fantastic position, we still have loads to play for, we will learn and move on. We had a lot more control than we have in a long, long time away from home but we just weren’t good enough." It was a costly defeat for fifth-placed Tranmere, who remain four points off the automatic-promotion spots and face a difficult run-in with four of their remaining fixtures against the current top six. One of those is away to league leaders Lincoln, which may explain Imps boss Danny Cowley's attendance. Rovers looked a notch below the four teams ahead of them – Lincoln, MK Dons, Bury and Mansfield – and even Forest Green in sixth may be a better side on the evidence of this encounter. Bury's money troubles could throw a spanner in the works but others would be preferred to Tranmere in the playoffs despite an outstanding run that has propelled them into the promotion reckoning. The result made it successive 2-0 wins for Oldham and they looked a solid side, not one that was harmed by Paul Scholes's recent departure after 31 just days in charge. Clarke and George Edmundson looked after Norwood well and livewire Lang has the potential to play at a higher level. They are stuck in mid-table but showed no signs of jacking in the season under short-term coach Peter Wild. Oldham 4-2-3-1: Iversen; Hamer, Clarke, Edmundson, Iacovitti; Missilou, Maouche; Branger, Lang, Nepomuceno; O'Grady (Sylla 81). Tranmere 4-2-3-1: Davies; Caprice, Ellis, Monthe, Ridehalgh; Perkins, Harris (Smith 53); Morris, Banks, Jennings; Norwood. Oldham: Colchester (a), Swindon (h), Cheltenham (a), Mansfield (h), Exeter (a), Newport (a), Northampton (h). Tranmere: Newport (a), MK Dons (h), Forest Green (h), Lincoln (a), Bury (h), Crawley (a).